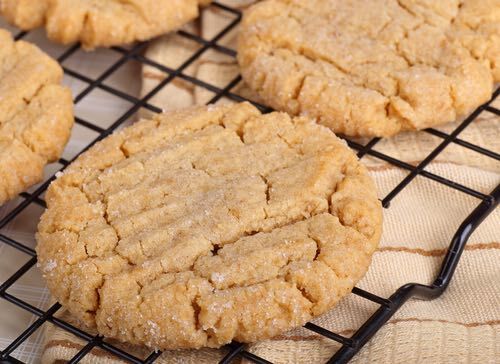 Here's a great collection of easy peanut butter cookie recipes that were Grandma's favorites. The richer taste of peanuts was what made her cookies unique. The difference was that she made her own peanut butter. Did you know that old fashioned recipes didn't call for peanut butter as it wasn't common in stores until the 1920s? Earlier recipes called for finely chopped or rolled peanuts, a form of homemade peanut butter. 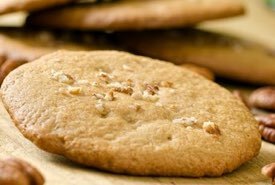 So, if you prefer to modernize these vintage peanut cookie recipes, it's easy, Just substitute your favorite crunchy peanut butter for the quantity of chopped peanuts. But, do try the homemade peanut butter method too and enjoy the pure nutty taste. I think you'll love it. I never really cared for eating peanut butter on its own or in sandwiches. It's the one food item that I never developed a taste for. HOWEVER, I really love the all-natural peanut buttery taste of these vintage cookies. They are so delicious! Enjoy trying these easy peanut butter cookie recipes. To modernize the vintage peanut cookie recipes, simply substitute crunchy peanut butter for the finely chopped or rolled peanuts. 1/2 cup peanut butter, 1/2 cup shortening, 1/2 cup brown sugar, 1/2 cup white sugar, 1 egg, 1-1/3 cups flour, 1 tsp baking soda, pinch salt. Mix, flatten and bake. Makes about 36 two-to-three-inch cookies. Walnuts may be added. We are very fond of them made as follows: 1 egg, 1 cup brown sugar, 3/4 cup shortening, 2 cups flour sifted with 1 teaspoon baking soda, 1 teaspoon cream of tartar, pinch of salt. Add last 1 cup rolled peanuts. Drop on a greased pan and press down with a fork. A macaroon is really a species of drop cookie, but a macaroon mixture is not really a dough. It usually consists of nuts, fruit or some solid material held together with beaten egg or stiffly beaten egg white. 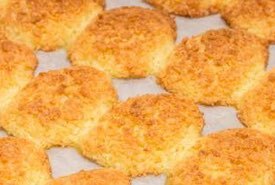 In baking macaroons, it is a good precaution to put an oiled paper in the bottom of the baking pan and drop the mixture by spoonful on the paper. Bake in a slow oven. If the cakes do not loosen from the paper readily, turn the paper upside down on a board and moisten it. The cakes will then loosen readily. Whites of 2 eggs, 2/3 cup powdered sugar, 1 cup finely chopped roasted peanuts, 1/8 teaspoon salt. Beat the whites of the eggs until stiff, add the sugar and beat in the finely chopped peanuts and salt. Drop by spoonfuls on an oiled paper on a baking sheet and bake in a moderate oven. 2 cups moist coconut (shredded), 1/2 cup peanut butter, 4 teaspoons vanilla. Mix all ingredients, keeping back 1/2 cup coconut; shape mixture into bars or balls and roll in remaining coconut. 1 cup peanuts (chopped very fine), 2 tablespoons butter, 1 cup sugar, 3 eggs, 2 tablespoons milk, 1/4 teaspoon salt, 2 teaspoons baking powder, flour to roll. This will also make almond or walnut cookies simply by changing the type of nuts. 2 tablespoons butter, 1/4 cup sugar, 1 egg, 1 teaspoon baking powder, 1/4 teaspoon salt, 1/2 cup flour, 2 tablespoons milk, 1/2 cup finely chopped peanuts, 1/2 teaspoon lemon juice. Here's a very simple recipe for making peanut butter cookies the entire family will love. Pre-heat oven to 375° Fahrenheit. Add all ingredients to medium sized bowl and mix thoroughly. Drop the cookie dough by tablespoonfuls onto the baking sheet about 2 inches apart. Once all cookies have been put onto the sheet (about 15), take a fork and press down on the cookies, marking them with an X.
Bake cookies for about 11 minutes. Remove from oven and take cookies off the sheet after about one minute. Cool, then enjoy! You will never find an easy peanut butter cookie recipe in 19th-century recipe books. That's because peanut butter had yet to be invented. Although the "Process of Preparing Nut Meal" was patented by the Kellogg brothers in Battle Creek, Michigan as early as 1895, and peanut butter was first sold as a snack food at the Universal Exposition in St. Louis, in 1904, it wasn't until the early 1920s that creamy peanut butter as we know it was first introduced to the marketplace. And, it wasn't until the late 1920s that recipes for peanut butter cookies began to appear in magazines and cookbooks. 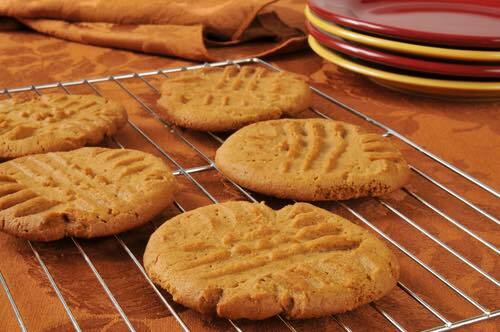 You'll love the taste of these peanut cookies made with today's peanut butter. But, they're equally delicious when made the old fashioned way using finely chopped peanuts. Why not try making them both ways and see which way you prefer?